The Pee Dee River begins as a small spring (now under a parking lot) adjacent to the Green Park Inn in Blowing Rock, North Carolina. 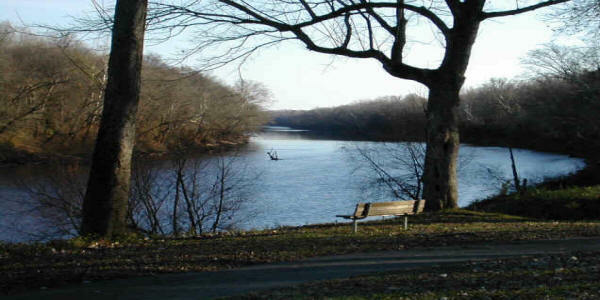 It flows generally to the southeast through western North Carolina as the Yadkin River and is dammed in several places. Just east of Charlotte, NC, at the confluence with the Rocky River (or the Uwharrie River, this is the subject of some debate), it takes on the name Pee Dee River, and is once again dammed at Blewett Falls Lake. Below this impoundment, the Pee Dee flows freely into South Carolina and to Winyah Bay at Georgetown. 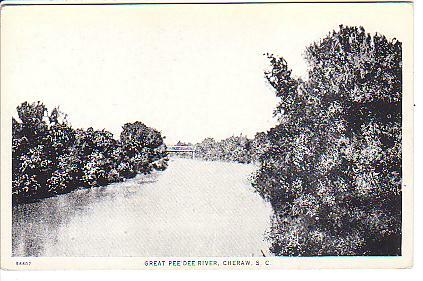 In South Carolina, the main stem of the river is known as the Great Pee Dee River to differentiate it from its much smaller tributary the Little Pee Dee River. The Pee Dee is a large river which flows through bottomland forests, cypress swamps, and eventually into the coastal flats. The extreme lower Pee Dee River flows through the region where rice plantations were the predominant economic engine of South Carolina before the Civil War. 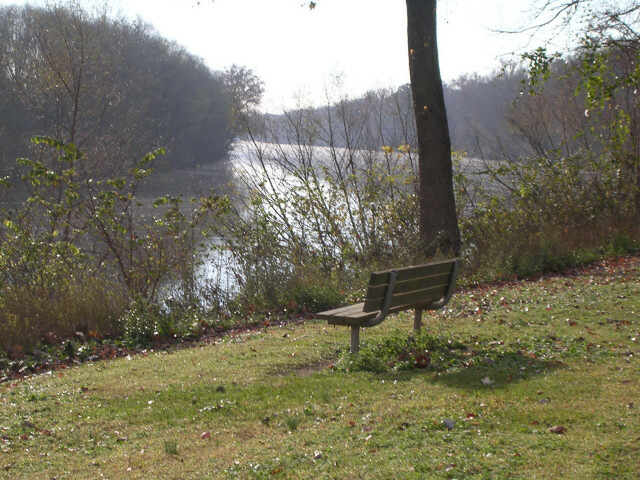 A pleasant tradition (though not true) has developed that the eminent American composer Stephen Foster (1826-1864) toured South Carolina in 1851, and that while visiting friends at a plantation near the Pee Dee river, became quite entranced with the natural beauty of that waterway. Consequently, he declared that the Pee Dee would appear within the lyrics of his next song. After returning to his home in Pennsylvania, he composed a piece entitled, "Old Folks at Home." The first line initially did read, "Way down upon de PeDee ribber" but the music publisher (Firth, Pond, and Company) demanded that the name be changed to Suwannee river. The truth is Foster never visited South Carolina, much less the Pee Dee River. It is generally accepted that he composed the lyrics after hearing another song, "Old Pee Dee," and wrote the quatrain that included its name. Always a perfectionist, he decided to use an original name of a southern river that was not taken from another song. His brother was enlisted for the task and, after perusing a marine atlas of North America, came upon the name Suwannee. The rest is history! --edited from the "Canoe Camping--USA" page. 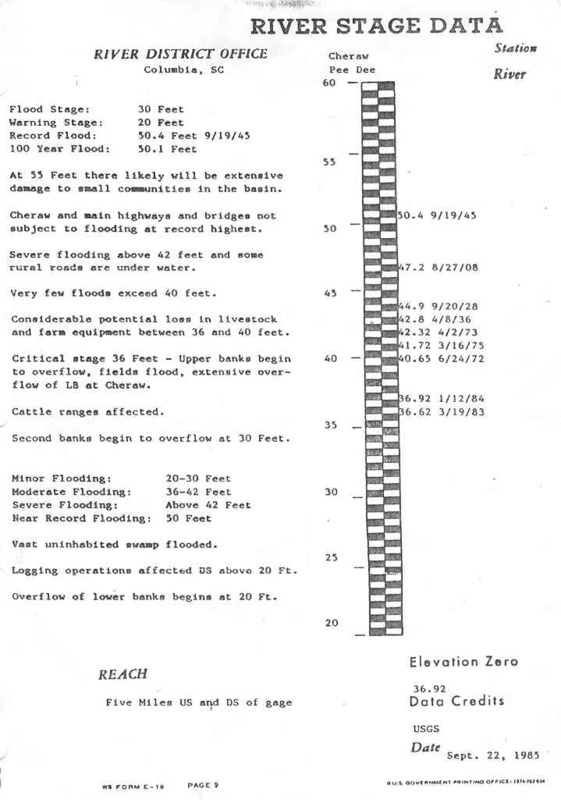 An information sheet showing some of the highest river levels and what to expect as the river hits each level. The highest recorded river level is 50.4 feet and occurred on 19 September 1945! Click on any of the thumbnails to enlarge an image. 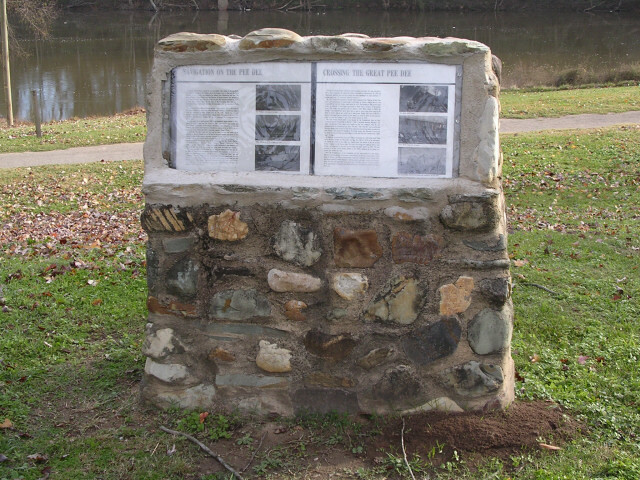 Historical marker located at Laney Landing in Cheraw. More information from the marker is shown below. 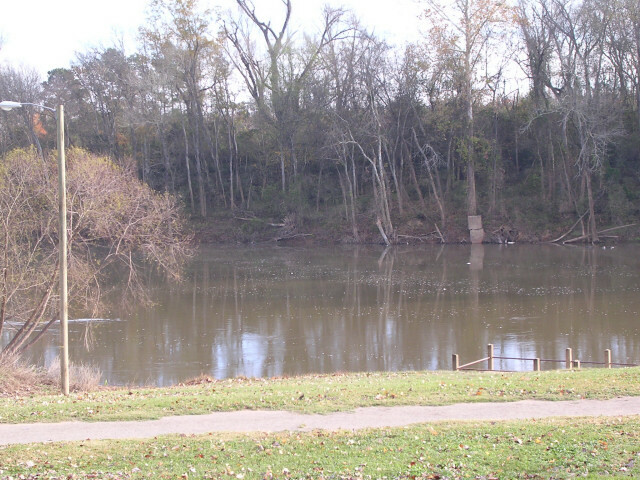 Click here to go to the historical pictures page for the river landing. Great Pee Dee River in Cheraw, SC. History of the River: The Great Pee Dee River, named for an area Indian tribe, begins in Blowing Rock, NC where it is known as the Yadkin. One of the longest rivers to flow into the North Atlantic, it was a natural thoroughfare for Indians that inhabited this area. The most powerful of these Indians were the Cheraws. Of Siouan descent, they maintained a well fortified village near this site on the river hill. The Cheraws reached the height of their power around 1650. By the time of the Revolution they had been so decimated by wars and disease that they left here and joined the Catawbas in North Carolina. 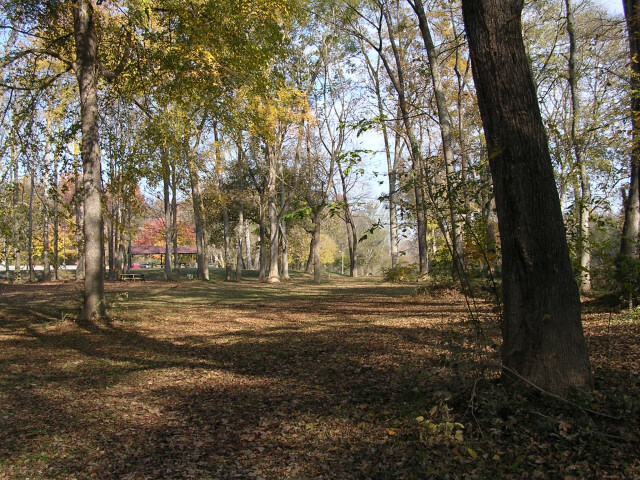 The Indian trails were natural beginning for trading centers. Taking advantage of this, James Gillespie, in association with Christopher Gadsden of Charleston, began a trade and navigation business around 1740. By the 1750's Cheraw was an established village and the Kershaw brothers, among others, had stores at the top of this hill, which was known as "Yankee Hill" for the numerous New England merchants located here. The town grew slowly until around 1820 when steamboats began coming up river. Among the first of these was the "Great Pee Dee" whose builder and captain was Moses Rogers, commander of the famous "Savannah", first steamship to cross the Atlantic. Capt. Rogers died enroute to Georgetown and is buried at Old St. David's Church, as is his friend and fellow steamship captain, Daniel Elkins. In 1822 the "Pee Dee" took four days and six hours to make the round trip to Georgetown. Because Cheraw was at the head of navigable waters, the advent of fast round-trip river traffic greatly increased Cheraw's already important position as a regional trade center, a state which continued until just before the Confederate War and the arrival of the railroad. Some of the steamships were the "Robert Martin" and "Maid of Orleans", "Osceola", "Swan", "Anson", "Marion", "Charleston", "Columbia", and the "Chesterfield". These were usually shallowdraft side wheelers, and then could only run in the fall, winter, and spring when the water was highest. The importance of river trade began to wane with the coming of the railroads, but in 1907, the Cheraw and Georgetown Steamboat Co. was organized to revive river trade. The channel was cleared, and the company purchased the "Ghio" (see pictures) and the "Merchant". A trolley track (see a picture), beginning close to where the boat ramp is now, went up the hill to warehouses at the top, one of which is still located across from Pee Dee Baptist Church. This company continued to operate until 1914 with a boat service every other day. The last attempt to revive river traffic was in 1939 when the tugboat "Helen" came up river. 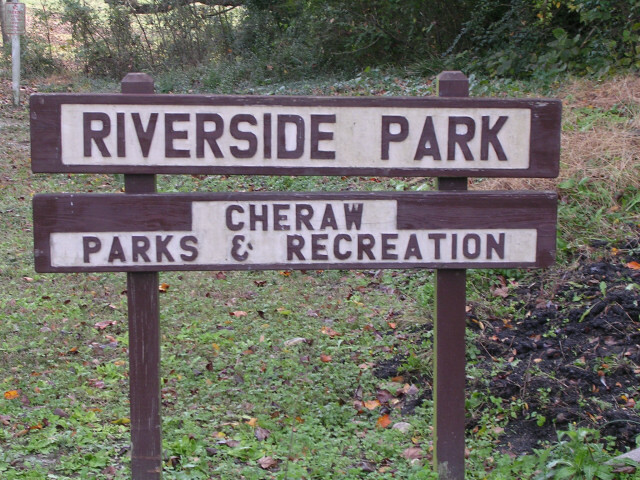 Bridges at Cheraw: Cheraw 's earliest bridges and ferries were located just below this sign. Kershaw's Ferry was in operation for about fifty years, although not continuously. In 1796, the legislature specified that the ferry charge was foot passengers 4ï¿½, man and horse 7ï¿½, wagon and team 75ï¿½, and every head of cattle 4ï¿½. By 1821. traffic was enough to warrant the formation of the "Cheraw Bridge Company" for the purpose of constructing a toll bridge at Cheraw. George Hearsey was responsible for the first bridge, constructed in 1824. The building of this lattice mode bridge is believed to have been supervised by Ithiel Town, inventor of the bridge truss. This bridge was carried away by flood in 1826. When rebuilt in 1828, the rules stated that slaves must have a pass to cross, users must keep to the right of center, and no one could stop in mid-stream. Bridge tolls were $1.00 for a private four-wheel carriage drawn by four mules, six cents for those on foot, and two cents for each hog, sheep or goat. This bridge burned in 1836. The next bridge lasted until it was burned by the Confederate Army as they retreated toward Fayetteville on March 3, 1865. 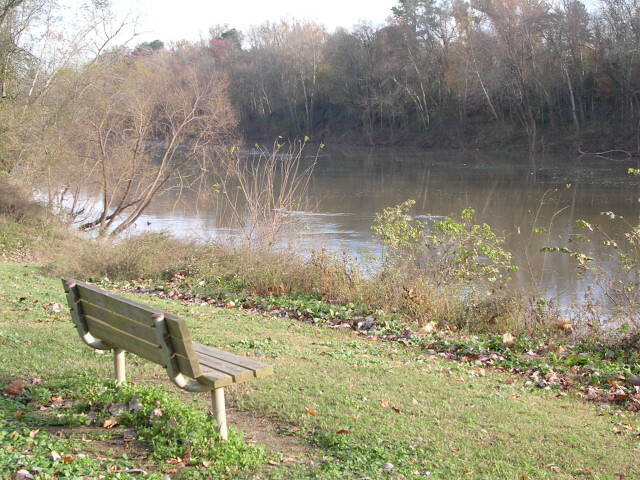 A skirmish between Sherman's Advance and Hardee's Rear Guard was fought on this site, complete with the only engagement of the Confederate gun boat "Pee Dee". The "Pee Dee" was scuttled less than two weeks later to keep it from being captured, never having been anywhere except Cheraw. The successful burning of the bridge meant that Sherman's forces had to remain in Cheraw until pontoon bridges arrived, and the river receded from "Sherman's Freshet." In 1866 the covered bridge was again rebuilt, continuing as a toll bridge until 1899 when the town bought the old bridge. On Aug. 26, 1908 at 12:20 in the afternoon, the bridge went down in the midst of a raging flood. (See some pictures of the bridges.) One section of the old covered bridge remained on the Cheraw side. The rest. of the bridge was replaced with a steel bridge, and remained in use until a new bridge was built upriver in 1939. The last section of the old covered bridge burned ire the 1940's. Remains of the pilings are visible just below this sign. With the disappearance of the steamships and the construction of a new bridge, this area was abandoned and became a town landfill. 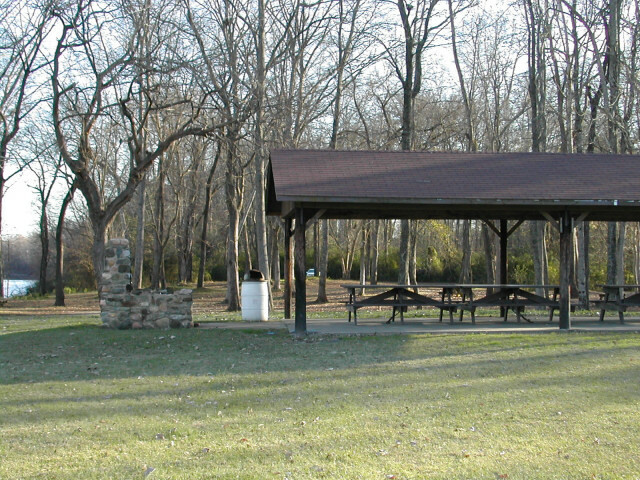 In 1975 as a joint project of the town of Cheraw, the Cheraw Bicentennial Commission, and the Cheraw Civitan Club, the former landfill became this park allowing people once again access to the mighty Great Pee Dee. And sometime if you listen very carefully you can still hear the bells of an approaching steamship and maybe see in the rising mist the shadow of things long past. 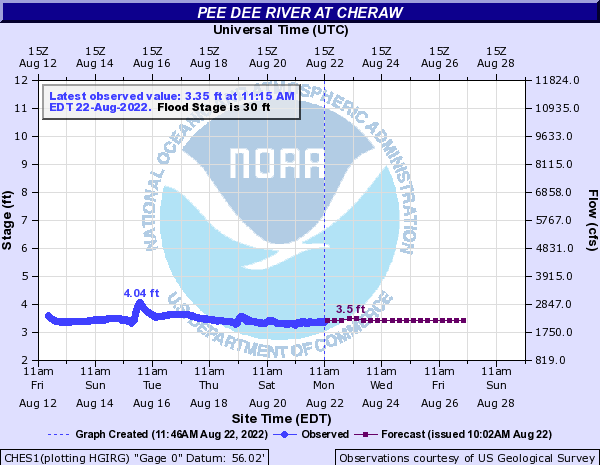 Current Condition on the Pee Dee at Cheraw From the National Weather Service. The blue portion of the graph represents actual river level measurements, the green portion is the predicted level of the river over the next few days. 55.0' EXTENSIVE DAMAGE OCCURS IN SMALL COMMUNITIES DOWNSTREAM FROM CHERAW. 50.0' EXTENSIVE FLOODING OF FARMLAND AROUND AND DOWNSTREAM FROM CHERAW IS EXPECTED. 42.0' SECONDARY ROADS DOWNSTREAM FROM CHERAW BEGIN TO FLOOD. 40.0' POTENTIAL LOSS OF LIVESTOCK AND FARM EQUIPMENT IN RIVER BOTTOMLAND POSSIBLE. WILL BE FLOODED. LIVESTOCK AND FARM EQUIPMENT SHOULD BE MOVED TO HIGHER GROUND. 30.0' HIGHER BANK BEGINS TO FLOOD. LARGE AREAS OF FARMLAND AND RIVER BOTTOMLAND FLOODED. 20.0' RIVER BOTTOMLAND DOWNSTREAM FROM CHERAW WILL BEGIN TO FLOOD.